A ceiling fan does not need to be purely utilitarian – yes, it needs to create a breeze, keeping your room cool and refreshed, but it can also act as a decorative piece that adds to the look and feel of your room. Ceiling fans saw a decline as air conditioning became more popular, but what people often forget is that ceiling fans are not only cost effective, energy effective and environmentally better than air conditioning, but they also act as a definitive decorative feature in their own capacity. 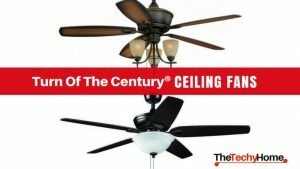 Here, we are going to provide you with 10 amazing decorative ceiling fan styles: each will include a description as well as a link to an example from Amazon.com, and each will encompass uniqueness and modernity. When it comes to ceiling fans, sometimes the most simple way to achieve modernity is through kicking it old school. A rustic, rural, countryside feel can double up and help to achieve a slick and authentic atmosphere in your house. It is simple, yet decorative and visually important, while still retaining a humble feel. Our recommendation: BAYCHEER HL371436 Industrial Vintage style “Rustic” can mean different things to different people – it can mean a very plain, wood-based panel that neither adds nor detracts from the décor of the room, but rather completes it, subtly filling the space without distracting from it. It can also mean an active effort to create an old school feel within a modern space: incorporating the old and the new, the modern and the rustic. Black Ceiling Fans are the “little black dress” of modern ceiling fans – a symbol of class, chic and modern sophistication. More importantly: it works with anything and is a safe bet if you are ever unsure on the best fit for your room. This decorative ceiling fan will create an atmosphere that is unrivalled, it will not clash with your further modern decorations, but it will certainly compliment it. 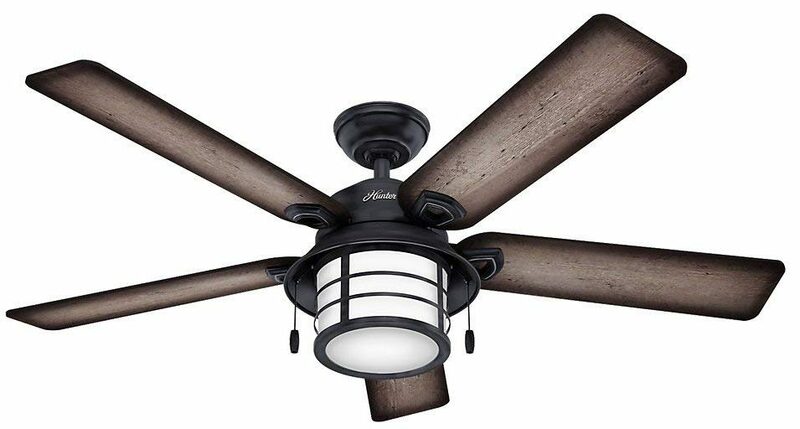 A black decorative ceiling fan can provide a sophisticated edge. 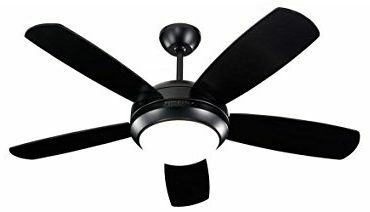 Our recommendation: Monte Carlo 5DI44BKD Discus II This matte black ceiling fan is a fusion of modern and classic. You really can not go wrong with a matte black, as history has shown. It blends into the scenery while adding to it – what a fusion. Simple is, ironically, the best way to make something unique, intricate or complicated. A white ceiling fan has a bad reputation of being the stock ceiling fan – one that is bland, or standard, or one that simply blends into the ceiling and has no purpose other than its functionality. This does not have to be the case – a white ceiling fan, however successfully it cools your room, can be amazingly decorative too. A white ceiling fan can be a statement piece – a statement that you will want to make. Our recommendation: Minka-Aire F844-WH Light Wave White White furniture can scream sophistication and taste, if used correctly. That is why we recommend this amazing decorative ceiling fan – its curved blades only accentuate its colour. The fact that this is an adaption of a simple white ceiling fan that is such a well-known household classic is why it embodies modernism so effectively. It merges the old with the new, trendy and unique. While white, black or rustic ceiling fans all retain a sense of modernity and a contemporary feel, they still can be considered, in the examples we have provided, as classic ceiling fans in terms of shape and look. 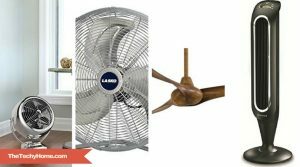 There are many contemporary fans that can be used decoratively – they come in different shapes, variations and sizes. 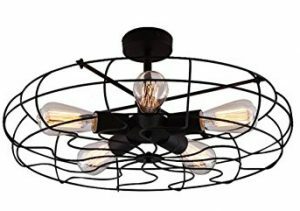 Contemporary implies moving away from tradition, and you will find that there are many ceiling fans that make an edgy and interesting movement away from this tradition, particularly this one. This modern movement away from the single fan to the double fan is an amazing decorative feature – while the elements themselves are classic, the execution is contemporary and unique. Three Blade Ceiling Fans are the trio you need to ensure you have an amazing decorative ceiling fan in your home. It creates a sense of balance. It is a classic formula, but can be adapted in enough ways that it is still considered modern. This fan has a classic three blade structure paired with beautifully crafted blades that combine the world of custom with elements of modernity. The best way to capture something unique without risk of failure is to adapt what you know works already. Thus, with the three blade fan, you’re already half way to success and you have another half to use creatively and differently. While you can achieve modern and unique ceiling fans for decorative use while still remaining reasonably conservative and simple, this is not always what you want. Simple works for some people, but some prefer elegance and sparkle, which is why a fancy ceiling fan may be just what you need to accessorize your home. 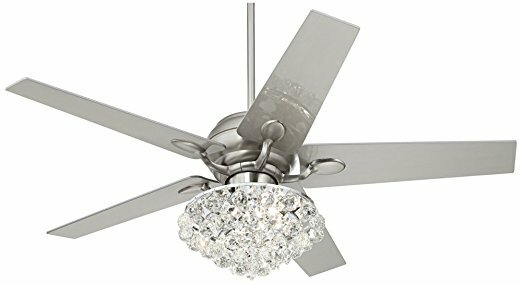 Crystal, glitz and glamour are guaranteed with this ceiling fan. While some will try achieve elegance by simply having a ceiling fan that blends in with the other décor in the room, others will use the opportunity of the beautiful ceiling fans on offer to create a centrepiece. Accepting the modern world and the décor ideas produced within it means acknowledging that sometimes, a bit of sparkle is all you need to elevate a space and make it yours. For a child, an exciting room can make all the difference – whether it is because it boosts their confidence, or because they feel comfortable in their own creative space, a ceiling fan that screams fun and functionality is just what you need to make your child’s room unique… Just like you teach them to be. With a small Google search, you will learn that kids ceiling fans are not difficult to find. Everything from Barbie to Ken, from flowers to cars and bright fun patterns is available at the click of your mouse. This ceiling fan is unique and modern, but is not overly decorated to the point that you will struggle to keep the rest of your room in sync. 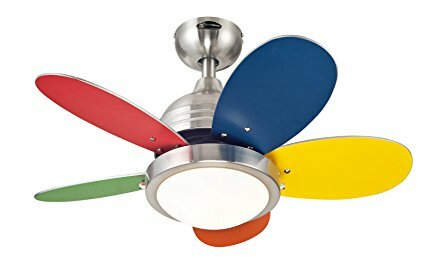 This ceiling fan is an amazing way to decorate your child’s room – 5 simple colours off of which you can create a space of love, fun and creativity. Traditional thinking limits our choices to plain patterns, vertical thinking and boring or dull colours. This is not a feature of the modern world or unique thinking. There really is nothing wrong with bold statements when it comes to modern décor. 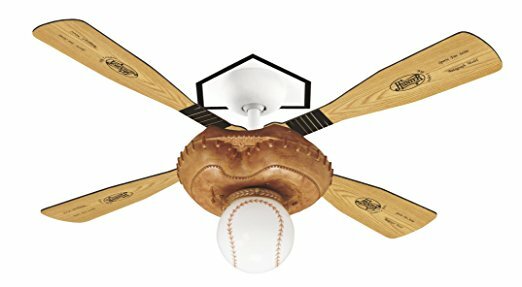 And what better way to show you are the ultimate baseball fan, than to get yourself a baseball ceiling fan? It is fun, it is funky and it is perfect for either a games room, a kid’s room or just an enthusiastic baseball fan’s room – there’s no judgement here. While it is a niche, gimmick style fan, it certainly is not distasteful if used in the right environment. Modernity is all about making the right décor choices in the right environment. Weathered wood ceiling fans will achieve a rustic, modern and unique look in your house. While they hold a traditional and simple reputation, they are capable of elevating your room to an elegant and modern space in which you can express yourself and be unique. This fan has the function of a modern piece of technology, and the look of a weathered piece of quality furniture. It incorporates the best of both worlds and could be both straight from a genuine farmhouse as well as a modern home. 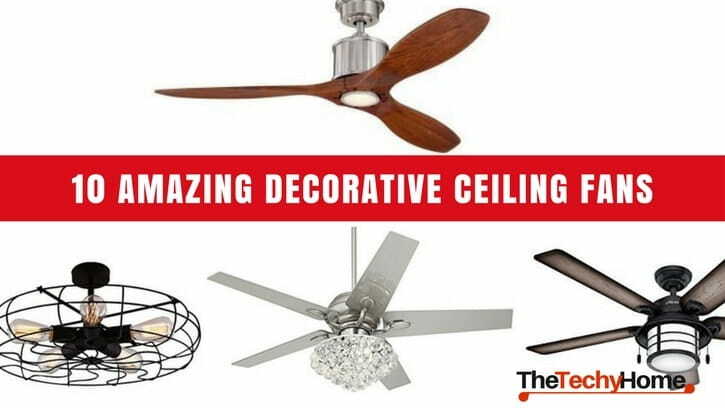 Sometimes, your best bet when it comes to amazing decorative ceiling fans is to go with a designer ceiling fan brand. While there’s nothing to fear from good quality alternatives, a Hunter’s fan radiates chic and ensures the room is keeping up with the times. Buying a designer ceiling fan ensures that you are guaranteed functionality as well as beauty and quality. The wood blades are sleek, but they also retain a certain traditional appeal that make the combination of elements more elegant and modern than traditional. 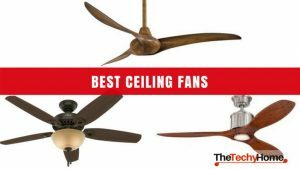 Between these recommendations, you should be able to find a ceiling fan that is amazing, decorative and an addition to your home that will make it a great décor success. 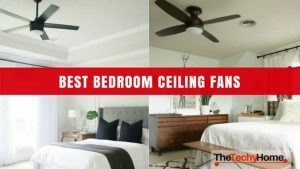 While sometimes you may find yourself concerned that people do not look up enough for it to be worth your worry when it comes to picking one out, it is underestimated what a difference a well-chosen ceiling fan can make to a room. Yes, you may not notice its absence, but you certainly notice its presence. Whether it is a rustic ceiling fan for your modern yet traditional home, or a baseball ceiling fan for the ultimate baseball fan, or even a kids ceiling fan, the options are endless and the reasons are here, plentiful and valid. Embellish your home decor with one of these Amazing Decorative Ceiling Fans.